ONCE A YEAR I DESIGN AND MANUFACTURE SOMETHING UNIQUE… well, THIS IS IT! The well-known artisan WALTER from Walterleica again steps out of his comfort zone and made an exquisite artistic form of a lifelike Leica camera! WALTER gives utmost care and attention to every detail of each piece of art, using his long-time skills and many hours, to form this little Leica camera entirely from brass, mounted on a wooden stand. It elevates the room and inspires dialogue. BE PRIVILEGED TO OWN ONE OF THESE UNIQUE WALTER ART PIECES !! PLACE YOUR ORDER NOW ! ! Remember, this is a limited edition where each art piece comes with an Authenticity Certificate signed by the artisan himself! Each Walter Leica product is individually manufactured by hand for the client. Please ensure that you have selected the product you want as there are no refunds. Kindly inquire about lead time. Limited edition only to order ! 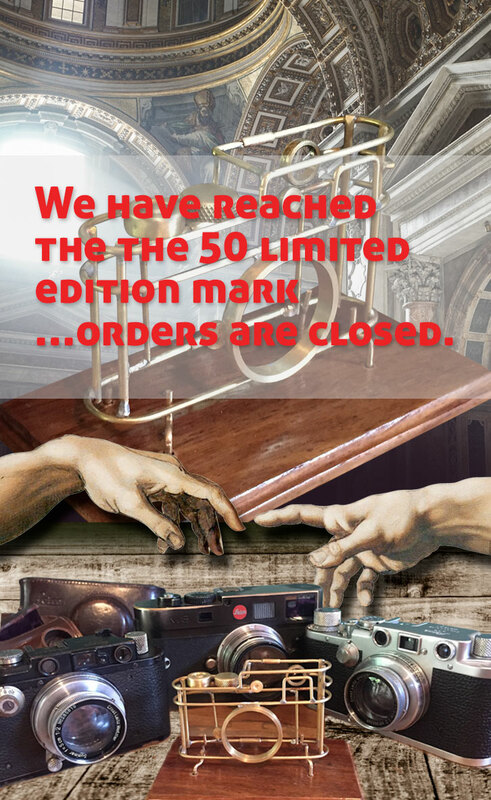 We have reached the the 50 limited edition mark…orders are closed.